This issue's article is by Dr Kamal N Rauniar, who is an educator, speaker, writer on Hinduism and a keen Community worker. He regularly organises as well as lectures on aspects of Hindu Dharma & Philosophy at various institutions of learning. Whilst continuing to be a student of Vedanta & Sanskrit, he is an ardent promoter of Vegetarianism and Spirituality. Dr. Rauniar writes about the 9-point circle which was the subject of the main article in Newsletter 8, ten years ago. Concepts used: Nine-Point Circle, Digit Sum and Vinculum or Bar Numbers. The Nine-Point Circle (NPC - Fig.1) is an amazing tool to assign an "address" to every natural number in the universe through "Digit Sum" (DS) concept! DS is also known as "Digital Root" or, "Beejank", in Sanskrit. A DS of a number is found by adding all the digits of that number and, if the resulting number has more than one digit, then repeating the process until only one digit (0 to 9) is left. Thus every number has a "home" in the universal concept of natural numbers in NPC of Vedic mathematics. But so far, only positive integers have been used extensively in the NPC. I propose herewith full integration of bar or negative digits in the NPC. The advantage of doing so becomes quite clear when one is operating with Vinculum or bar numbers, in particular, to "quick-check" the answer, after converting a number into a vinculum. = 8 ' DS = 8 .....DS = -1 ? 18 ' DS = 9 .......DS = 0 ? So are the answers wrong? Here, our improved NPC comes to our rescue and tells us that in DS domain, 8 & -1 are equivalent and so are 9 & 0! (Vide Fig. 2). So the answers to the subtractions are correct! From the improved NPC we know that, for DS 5 & 4 are equivalent, therefore the answer of the conversion is correct. DS of 89 is 8, DS of 111 is 1 and DS of 91 is both 8 as well as 1. Again, we know that 8 & 1 are equivalent, hence their conversion is right. DS 168 = 6, DS 172 = 6 and DS 232 = 3 Again, the answers are correct. If we make any mistakes in the conversion, DS method together with the improved NPC would immediately flag the mistake up! The readers must have noticed by now that in DS domain, a positive digit is equivalent to its "bar number complement" of number 9! Readers may like to verify this "quick results checking method" in multiplication and division of vinculum numbers! With vinculum method one can convert any number to contain only numbers 5 or less as suggested by Dr Padiyar. This makes any mathematical operation even easier and is thus greatly enjoyed by the children! Win Powell sent me an email a while back which asked if you could divide 6104179 by 6913 in less than 12 seconds. Well, I said never. However it stuck in my mind and yesterday I decided to look at it. To my surprise I got 883 very quickly and my calculator confirmed it. I am interested in different ways of doing this. This is the way I did it. I assumed the answer was a whole number. It is clearly a 3 figure number. Since 6913 is near 7000 by dividing, the first digit must be 8. The units digit must be 3 by looking at the units digits in the question. To get the middle digit I looked at digit sums. The digit sum of 6104179 is 1. The digit sum of 6913 is 1. So the digit sum of the answer is 1, and so the middle digit must be 8. If you know of a different way please let me know. When my son Adam was in 7th grade, I was asked to come to his class and talk about Mathematics. At this point in their school careers, most of the students already found math to be very boring, difficult to understand and would opt out of the class if they could. Knowing this, I was going to try to see if I could ignite an interest in math that had already been extinguished probably years before, if it even ever existed. In order to do this, I felt that I would need to provide these students with a plausible explanation as to why they currently felt this way about math (and that it wasn't their fault) as well as something "mathematical" that they could get excited about. I began my talk with first drawing a big circle on the blackboard and wrote "Mathematics" inside if it. From this circle, I drew lines to other circles labeling them "Algebra", "Geometry" and "Trigonometry." I then asked the students how many of them liked to play video games. Of course, every hand in the class went up. I told them that I liked to play video games too. The only problem I had was learning all of the different key combinations before I could play the game. Sometimes, there were so many key combinations that it took quite a long time to "learn the rules" before I could "play the game." I found learning all of these rules very boring. I realized that once I could apply the rules, I would have a great time playing the game. Over time, I enjoyed playing the game even more as I was getting better at applying the rules. They all agreed that it was the same for them. At this point, I switched their attention from video games to mathematics. It was explained to them, much to the chagrin of their teacher, that learning the rules of each different area of math was admittedly boring. The problem was that, once they learned the rules and were "ready to play the game," they went to another area of math and learned the boring rules for it. They were never told about the "games" they could play. As an aside, I felt that this process would be continued until they got out of high school and were thoroughly disgusted with math. I now had their attention with them wondering what "games" was I talking about. I chose the circle labeled "Geometry" and drew two additional circles out of it labeled "Fractal Geometry" and "Topology." I explained to them with the rules of geometry, they could play the game of "Fractal Geometry." By playing this game, they could produce incredible computer generated pictures that would touch their imaginations and "ignite" their interest in wanting to explore this "game" even more. I printed out several fractal designs for them to see. This significantly gained their interest. These prints were passed around the class with the result being everyone wanting to know how to generate pictures like these themselves. I then touched on the game of "Topology". I asked them if they had ever seen a piece of paper with only one-side (i.e., Mobius Strip) or could imagine a bottle with no inside and no outside (i.e., Klein's Bottle). Everyone in the class got excited debating exactly how these "games" could be played. By the end of the class, I had handed out all of the fractal pictures I had printed and supplied them with internet links where they could go to find out more about Mobius Strips and Klein's Bottle. There definitely was a sense of excitement about discovering more about Mathematics, in general, and Fractal Geometry and Topology, specially. I think, on that day, I changed their minds a little bit about their thinking about math as being boring to math being a "game" to be explored and enjoyed. Here is the link to a research paper by Ajinkya Kale, Shaunak Vaidya, Ashish Joglekar which shows a multiplication algorithm involving repeated applications of the Nikhilam multiplication method. Please feel free to include it in your next newsletter. We are still in beta release, hopefully in the coming couple of months we can have a finished product. Also any feedback and review from your side is more than welcomed (). Launch of Language Core Programming Educational Initiative. West Cork Hotel, Skibbereen, Co. Cork, Ireland. This is a new development in relation to computation which will include aspects of Simple Sums, Vedic Mathematics and Gaelic knowledge. The aim of this initiative is to develop an integrated approach to teaching computation and language in all the languages of the Earth. Already certain techniques have been adapted, in an informal sense to more than 200 languages, and this development aims to introduce a more systematic approach. It is very important that computation is adapted properly, naturally and respectfully into the Mother Tongue of all groups on Earth. This dissolves the type of cultural imperialism which is being promoted by information technology companies. An off shoot of this project will promote the development of knowledge and technology to allow for the creation of software systems so that computer software can be written in any language on Earth, in such a way that it will run on any computer on Earth. A precursor to this ability was already created in relation to the Irish language more that 10 years ago. However we start very simply, by just building libraries of computational words and concepts in relation to arithmetic, vedic mathematics, and some simple comprehensions in relation to the computational knowledge enfolded within every Mother Tongue on Earth. The method for squaring numbers that end in 5 applies also for squaring hexadecimal numbers, but the final digit is not 5. It's 8. I posted an article about this on one of my blogs lately - http://fiat-knox.livejournal.com/878936.html. Looking for a good Vedic maths tutor for limited time or on-going to present maths in an interesting and simple way to my son . He is 5 but at least 2 and half years advanced in maths . He has a natural ability for the subject and I want to encourage it by presenting it in a nice way. 22 X 13 = 2 __ 6. Give one space in between since it is a duplex number. (b) Now add the corner numbers ( 2 + 6 ) and write in the middle. (c) So the answer is 286. 333 X 15 = 4 _ _ 5. Give two space in between since it is a triplet number. (b) Now add the corner numbers (4 + 5 ) and write in the middle. (c) So the answer is 4995. (a) When the product is a 3 digit number when you multiply one figure of multiplicand with the multiplier then , 6 X 19 = 114. write this number as usual giving a space. 11 _ 4. (b) Now add the corner numbers ( 11 + 4 ) and write only the units digit in the space and add the excess digit to the left side number. (c) So the answer is 1254. This rule is applicable for triplets numbers also. Write only the units digit in the space and always add the excess digit to the left side number. Contact ; Gsm no. 00968-96568599. 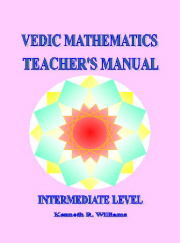 I have been a teacher of Vedic Math for over 10 years. I am also the moderator of the largest Vedic Math special interest group in the world numbering almost 40,000 participants. Through workshops and lectures, I have been trying to spread the merits of VM throughout the United States. I am available to do 4-6 hour workshops both in person and on-line through Skype for all of you who want to discover a better way to learn math for you and your children.